Following is general admission info and hours for Naylor Family Farm Park. Group discounts and special hours are available for groups of approximately 20 or more people. Visit our groups page for more information. Park Admission Includes: Unlimited access to the Giant Corn Maze plus Barrel Train, Jump Pad, Picnic Area, Hayrides to our real Pumpkin Patch, 22' Farm Tower Fort, Corn Crib, calf and cow roping station, Pumpkin Air helicopter, and a visit with our Farm Animals. Each person with a paying pass will receive a FREE PUMPKIN which could average to 6 to 12 pounds per pumpkin. Here at Naylor Family Farm are goal is simple; to provide a safe, clean, entertaining place for all who enter. Our price structure is also simple, $18 per person gets you in to do everything and you leave with a free pumpkin. No gimmicks, confusing combos, or headaches. 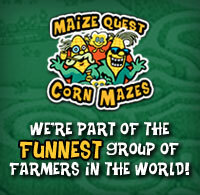 Naylor Family Farm Park & Corn Maze is open to groups of approximately 20 or more by appointment. Please visit our Group Rates & Hours page for details. The last ticket is sold 1 hour before closing. Groups hours available anytime by appointment. Flashlight Nights every Friday & Saturday night by appointment! Come try our maze in the dark for a different twist - but be sure to bring a flashlight in case you "get lost"! Flashlights are also available for purchase.